... 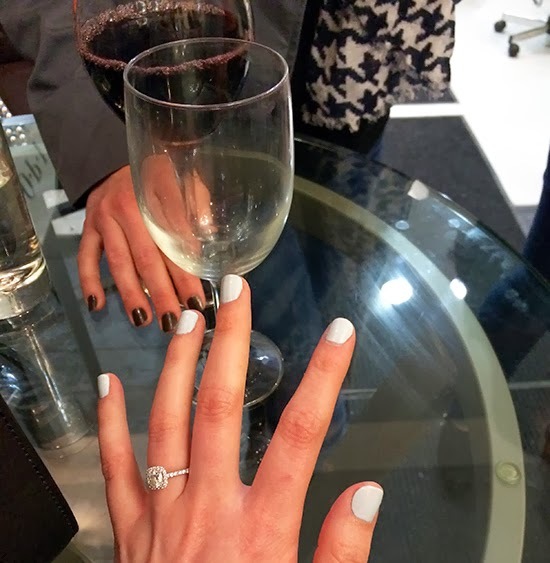 Went on a lady date to Arbre (err, now Polish & Pour?) for some manis and bottomless wine & champagne. ... Toyed around with the idea of actually decorating our powder room, but only accomplished getting a rug we may not keep. ... Hit Bub City for some barbecue, and discovered the weirdest thing I've ever seen in a bathroom. ... Had some super amusing conversations with cab drivers about how hot the nightlife is in Ghana, how you can't live with or without women, and how girls in Russia named Kristina are always the prettiest. ... Went out with the boy to the new(ish) Giordano's in our neighborhood for pizza and the Opening Ceremonies. I am weirdly pro those sweaters the US team wore. ... Went to Durkins, the crappy bar of my youth, and danced to two Nelly songs within the first 10 minutes. ... Watched about eighteen hours of figure skating coverage before figuring out how the team competition worked. ... Went out with the (almost) in-laws for a little dinner date in Oak Park. ... Ate about four hundred popsicles. This is a new obsession. Did you know they sold them in packs with just grape, cherry, and orange, so no one has to eat the crappy flavors? ... Made some crockpot chicken noodle soup. The recipe made so much I think we'll be set for dinner for the next six to eight weeks. Sounds like you had a great weekend! I love that you developed a popsicle obsession haha! i love your engagement ring - it's so gorgeous! Crockpot chicken noodle soup sounds so delish! You always have such fun weekends! Mine would be like: ate Korean food, cleaned the house, watched The Hobbit, bought groceries. Derp. I need to start doing more with my time! Yeah...I had a great weekend but I can't disclose ALL the details! Haha, this is like the most exciting weekend I've had in a while. Normally I just sleep and do homework! Polish and Pour? Man, that sounds so nice right now. Rose and a pedicure please! Wow you had a really busy weekend, your nails look great! Oh my gosh so so good. Just had a bowl, yummmmm. Your ring is beautiful and I love your nails! love that you danced to Nelly! Too awesome!